" .....and to facilitate the process, please send submissions marked in the subject line 'For Ribbons' to me at tropicsf@earthlink.net. Anything else not intended for _Ribbons_, please put 'Shejidan' somewhere in the subject line. "Those who choose to write articles are free to pick their own topics, though in the interest of preventing duplication it might be wise to announce one's intent here before writing an article. I'd like to start with a 1,000-word limit per article, because I have to draw the line somewhere. Any artists are also encouraged to ponder submitting art, or at least letting me know they're interested in providing some art for the journal. I'm thinking of simple line art, not the very fancy kind with which the Shejidan site is graced. "In order to strive for a level of quality, if I am editing this journal, I reserve the right to ask for revisions. Writers have the right to refuse, whereupon I have the right to turn down their submission. Since I would rather publish than reject, please keep in mind that while this is supposed to be fun, the non-poetry works submitted should also be grammatically correct and logically presented. This is what English Composition classes were meant for, but your teachers never realized it. Amaze me. "Poets are asked to keep their works to 20 lines or less. Image is key in poetry, as is the fresh way of describing something. Startle me, but spell the words right. Someone named OpalCat placed an item for bid on e-bay where people could name her pet snail. Guess who won? Heh! This little bit of news was too amusing not to post here. To any CJC fans out there who like to draw, contributions to the fan art page would be most welcome. If you're interested, please send reasonably sized images (as either JPG or GIF files) and I'll set up a page for you. If you need more details, click here. Some new things at the site.... First, Ansikalden has made a cool new picture, Atevi Portrait, for her gallery. Second, the personal pic page has been updated. (For those who don't know, the personal pic page shows a selection of 60x60 pixel images that members of the forum can use as I.D. photos, so to speak.) Third, four of Sabina's newest emoticons have been added to the forums. And finally, some errors on the downloads page have been corrected. 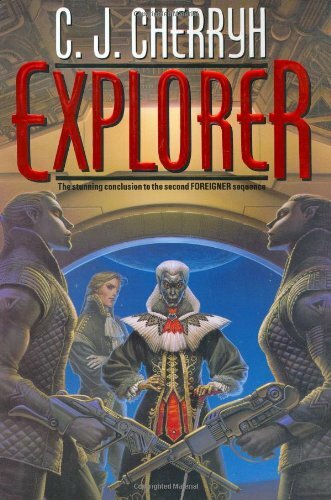 Sabina informs us that the official release date of Explorer, according to DAW books, is November 5, 2002. I don't know about you folks, but I have a feeling I'm going to be making a trip to the local bookstore that day. I'm looking forward to seeing a larger image of the cover art. What do you think of it? We've been discussing it to no end at the forum. Thanks to Lily Daja for the heads-up: the cover art for Explorer is now on-line. There is a small version of it at the Barnes & Nobles site, and a much larger version at Amazon.com (which hautdesert found). Curious to see what it looks like? Click here! Hautdesert was kind enough to bring this article by CJC at sffworld.com to my attention: Where is Science Taking Us? I'm not sure how old this article is, but there is a year 2002 copyright at the bottom of the page. Meanwhile, at our messageboard, current topics include everything from wishful thinking regarding possession of objects from CJC worlds to opinions in the monthly book club about Gate of Ivrel to comments on some authors' tendencies toward rampant preachiness (is that a word?) in their novels. Only 122 days until Explorer hits the shelves. How do I know this? Hautdesert's cool Explorer Countdown, of course. Find it and other cool goodies on the Downloads page. If you enjoy torturing yourself, try reading the first sentence of Explorer on Sabina's handy FAQ thread. See if you can do it without drooling with anticipation. Or, join the rest of us in guessing what the second sentence will be.